Ryu Hyabusa is coming back in a brand new videogame ... but not until next year. In an announcement that surprises absolutely no one, Tecmo Koei has revealed that a third Ninja Gaiden game is currently under development. The revelation was made at a private dinner event in Tokyo this week, but the game won't be on display at the Tokyo Game Show. According to GamePro, "the game is so early in development, the developer only showed journalists a piece of concept art. 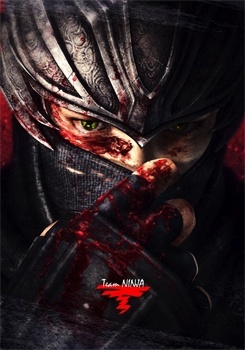 The image, however, defines both the new game's direction and the new identity of Team Ninja." The concept art can be seen at right. Meanwhile, according to Shack News, "Ninja Gaiden 3 will still be the blood-soaked romp players have come to expect, but it will also delve into the 'human side' of main protagonist Ryu Hayabusa." Team Ninja won't be revealing any information about the game until "early next year." Even the game's platform hasn't been announced yet (though, presumably, the 360 and PS3 will be on the list).